As described in previous blog post, Aina Muceniece Virotherapy Foundation pretends to be an organisation that defends the rights of cancer patients. Despite being a front-organisation for Rigvir Ltd., the manufacturer of an unproven cancer cure, it had weaseled its way into the biggest cancer patient NGO in Europe, European Cancer Patient Coalition, which is involved in the EU legislative health policy process and has access to serious stakeholders, including EU Commision and European Medicines Agency. After alerting ECPC to this fact yesterday, two things happened. First of all, the reaction of ECPC was immediate and as respectable as the organisation itself: a few minutes after we sent out the e-mail about the blog post, the director of the organisation replied, saying that the issue will be raised with the Board urgently. 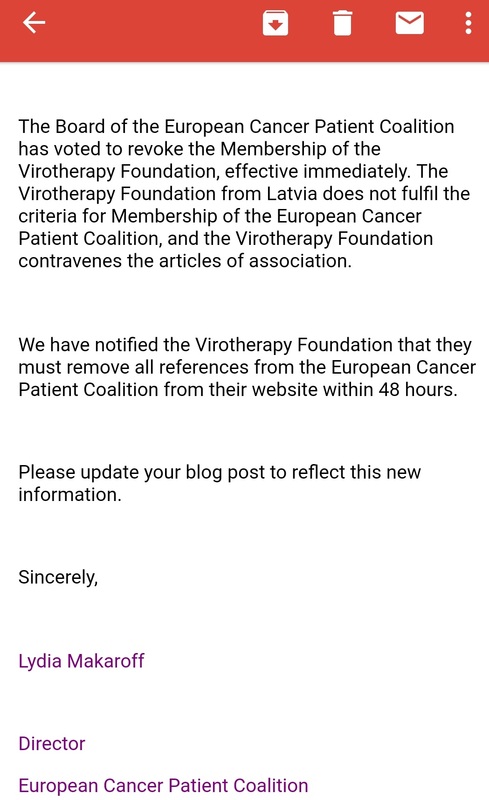 In the meantime, Virotherapy Foundation published another conspiracy-style announcement, accusing the authors of the blog of bias and undeclared financial and ideological support (funnily enough, the authors of this blog actually have declared their motivation and funding, contrary to VF). However, the Foundation refuted none of the facts exposed in the previous blog, although it would have been fairly easy to demonstrate that it fulfils the criteria for ECPC membership. This instance clearly illuminates the difference between approach to problematic Rigvir-associated entities in Latvia and in Europe. In Latvia public outcry had to happen before institutions even reacted to unmistakable breaches of law and in many cases official complaints to our regulatory institutions achieve precisely nothing (more on that later). In contrast, European organisations respond to issues that are not even strictly illegal, but are highly unethical and potentially harmful to patients. Hats off to ECPC and let us hope that regulatory institutions in Latvia learn to follow their example in protecting one of the most vulnerable groups of people – cancer patients. UPDATE: ECPC has revoked the membership of Virotherapy Foundation, please see this blog post. European Cancer Patient Coalition (ECPC), an organisation that protects the interests of cancer patients at the European level, has accepted as a full member Aina Muceniece Virotherapy Foundation, a front-organisation for a pharmaceutical manufacturer of a virotherapy drug Rigvir. Virotherapy Foundation proudly announced becoming a full member of ECPC in May 2018 and just as proudly displays ECPC logo on their website. Therefore it appears that Rigvir has engaged in astroturfing at European level by creating a fake organisation as a part of attempts to attract more foreign patients and gain more legitimacy to an otherwise obscure treatment. 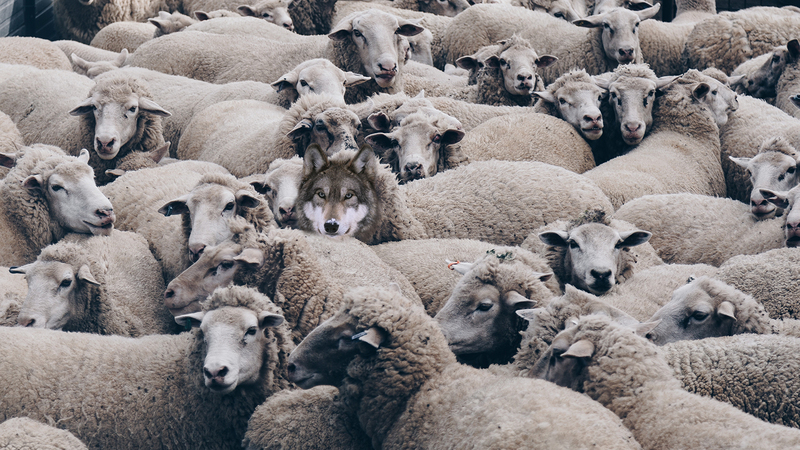 Latvian skeptics suggest caution: the Foundation appears to be a ‘wolf in sheep’s clothing’ and may harm cancer patients and the reputation of ECPC. Rigvir will no longer rip off cancer patients. What happens next?